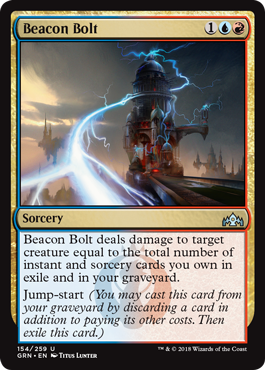 Not every Izzet deck will want this (I’d want 9+ spells and some card draw first), but if you can support it, Beacon Bolt will be quite powerful. Killing two creatures for 6 mana and your worst card is a great deal, and this scales up nicely. Sometimes the first Bolt takes out a 2/2 and the second kills a 6/6, so it’s great that you can use this while waiting for it to power up.